Producers Phil Lord and Chris Miller revealed new characters and showed off some funny unfinished footage of the multi-spider-person animated feature “Spider-Man: Into the Spider-Verse” Friday during Sony’s panel at San Diego Comic-Con 2018. 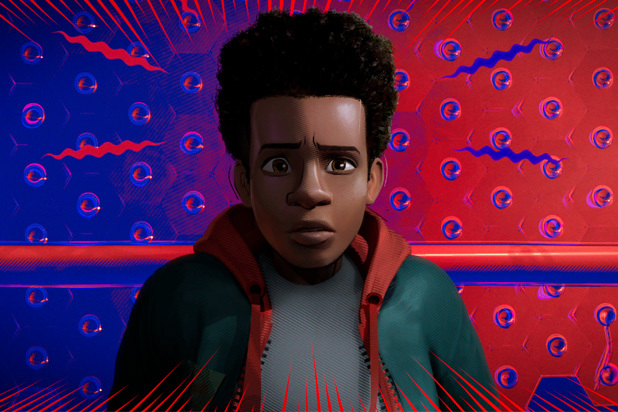 “Into the Spider-Verse” focuses on Miles Morales, a boy who comes to realize he has spider powers just like Peter Parker. In new footage shown during the panel, we see how Miles, a young Brooklyn kid, meets the original Spider-Man. Turns out, Spider-Man isn’t dead like Miles thought — or at least, another version of Spider-Man from a parallel dimension is still alive. That’s the crux of “Into the Spider-Verse,” as revealed by the movie’s first trailer: it finds Miles teaming up with Peter Parker from another universe, with Peter mentoring Miles on how to be his universe’s friendly neighborhood Spider-Man. The pair come to realize not only that they can reach still more universes, but that there are other Spider-heroes in many of them, including Spider-Man Noir (Nicholas Cage) and Spider-Gwen (Hailee Steinfeld). All the Spider-folks have to team up to stop something that threatens to destroy all their realities. The footage that we saw in Hall H Friday night — which was partially unfinished — largely focused on Miles’ story as he works to deal with his Spider-Man powers. In one scene, he gets his hand caught in Gwen’s hair, which requires cutting her hair to get her free of Miles’ spider-grip because he doesn’t know how to turn it off. The biggest sequence in the footage saw Miles visits Peter’s grave, only to have the alternate universe version of Peter come up behind him — who Miles instinctively and accidentally knocks out. Some cops arrive moments later, forcing Miles to carry an unconscious Peter Parker away sneakily — but things get complicated when Miles accidentally shoots his web at an elevated train and gets dragged through the streets. Because, again, he doesn’t know how to use his powers. The footage confirmed that Spider-Ham, an anthropomorphized animal version of the hero (real name Peter Porker), would be a character in “Into the Spider-Verse” as well. The footage ended with Miles and Peter finding themselves in the Spider-Verse meeting Spider-Gwen, Spider-Ham, Spider-Man Noir and Penny Parker, another alternate universe version of the hero. Morales will be voiced by Shameik Moore, while Jake Johnson voices Peter Parker. Liev Schreiber plays the crime lord Kingpin, Mahershala Ali is Miles’ influential uncle Aaron, Brian Tyree Henry plays Miles’ father, Jefferson, Luna Lauren Velez is Miles’ mother Rio, and Lily Tomlin plays Aunt May. 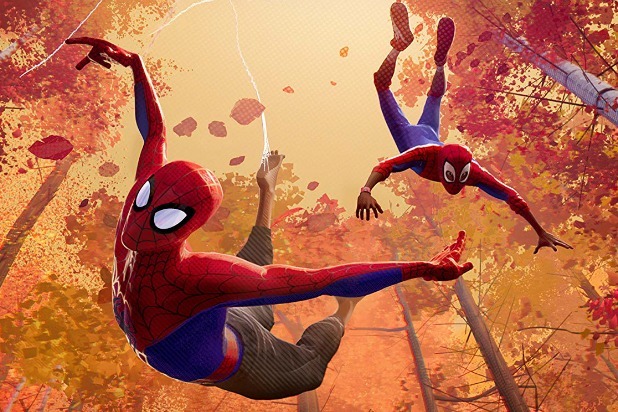 “Spider-Man: Into the Spider-Verse” is produced by Lord and Miller. Bob Persichetti, Peter Ramsey, and Rodney Rothman are directing from a screenplay by Lord. The film is produced, in association with Marvel, by Avi Arad, Amy Pascal, Lord, Miller, and Christina Steinberg. “Spider-Man: Into the Spider-Verse” opens on Dec. 14.